Twenty years ago today — February 20, 1993 — Japan launched the Asuka x-ray observatory from Uchinoura Space Center atop an M-3SII rocket. 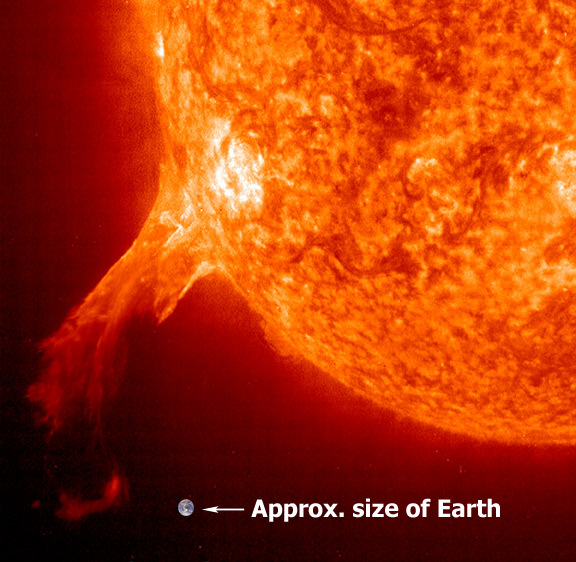 A solar flare on 14 July 2000 caused heating and expansion of the upper atmosphere, which increased the drag and external torque on ASCA. The attitude was perturbed, so the solar panels lost lock on the Sun, resulting in discharge of the batteries. ASCA reentered the atmosphere on March 2, 2001. This date in space history is also marked by another satellite’s destruction, but this time it was deliberate: 5 years ago today, the guided-missile-cruiser USS Lake Erie launched a missile to intercept a disabled reconnaissance satellite. You can read contemporary news reports at Spy Satellite’s Downing Shows a New U.S. Weapon Capability and Navy says missile smashed wayward satellite. Fifteen years ago today — February 11, 1997 — the Space Shuttle Discovery launched from Kennedy Space Center on a mission to refurbish the Hubble Space Telescope. Mission STS-82 astronauts Kenneth D. Bowersox, Scott J. Horowitz, Mark C. Lee, Steven A. Hawley, Gregory J. Harbaugh, Steven L. Smith, and Joseph R. Tanner completed five spacewalks during the mission and placed the telescope in a higher orbit. 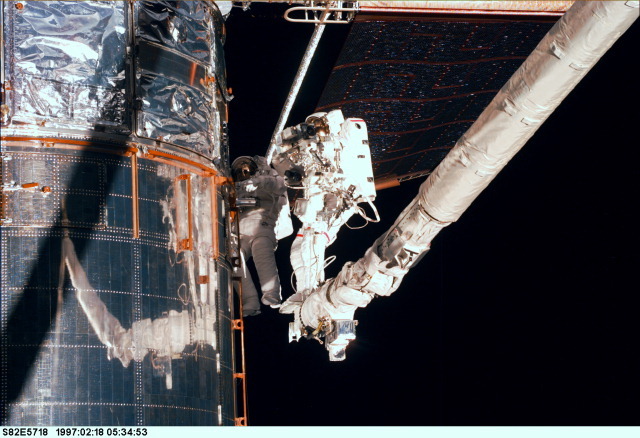 During the second EVA crewmembers “noted cracking and wear on thermal insulation on side of telescope facing the sun and in the direction of travel.” Mission controllers added a fifth spacewalk to the schedule so the astronauts could install insulating blankets — some of which were put together on Discovery‘s middeck during the mission — over key component areas. 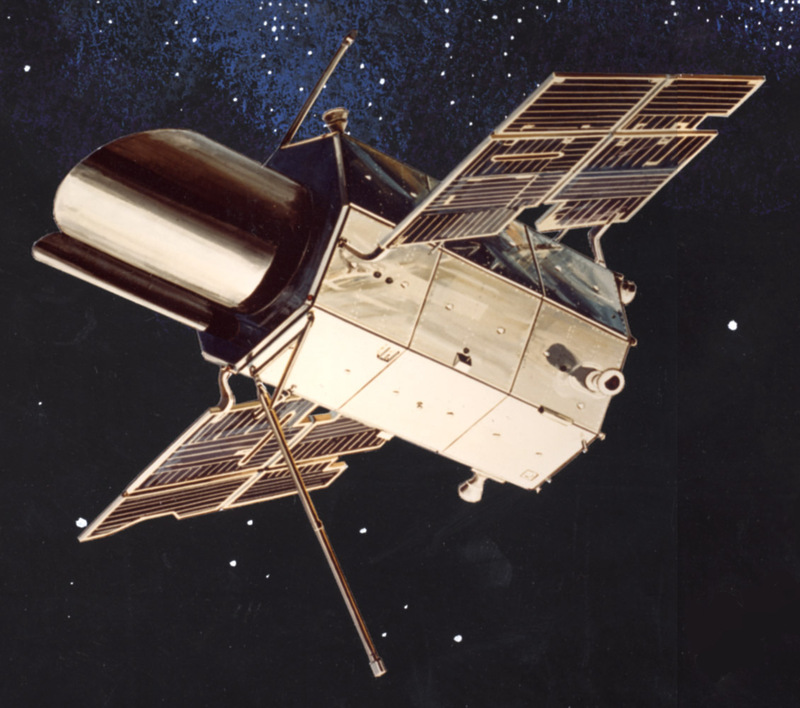 The first of the orbiting observatories that would be precursors to the Hubble Space Telescope, OAO-1 did not live up to expectations. Only 7 minutes after separation, the power system failed due to high voltage arcing in the star trackers and resultant battery depletion. Ground controllers ended the mission after 20 orbits, and the first of the OAO series made no celestial observations. Twenty years ago today — April 5, 1991 — the Space Shuttle Atlantis launched from Kennedy Space Center with a new observatory to place in orbit. Astronauts fixing things … sounds like a reason to continue with a human spaceflight program …. The new space telescope was later renamed the Compton Gamma Ray Observatory in honor of Nobel laureate Dr. Arthur Holly Compton, a pioneer in high-energy physics. The observatory remained in orbit until June 2000. As for UFOs: like many shuttle missions, the camera on STS-37 picked up an image of an object that appears to be in the vicinity of the shuttle. You can watch the 27-second video here and draw your own conclusion. Comments Off on How Big is the Universe? For ten days in 1995, the Hubble Space Telescope pointed its mirror to a small patch of seemingly empty sky near the Big Dipper and started collecting light. (“Seemingly empty” means that no stars or galaxies were at that time known to be in that particular piece of the sky.) The part of the sky being imaged was no larger than the apparent size of a tennis ball viewed from across a football field. It was a very small portion of the sky. What they found was awe-inspiring. Within that small patch of nothingness was far more than nothing. The image revealed about three thousand previously unseen galaxies, creating one of the most famous of Hubble’s images and my personal favorite. 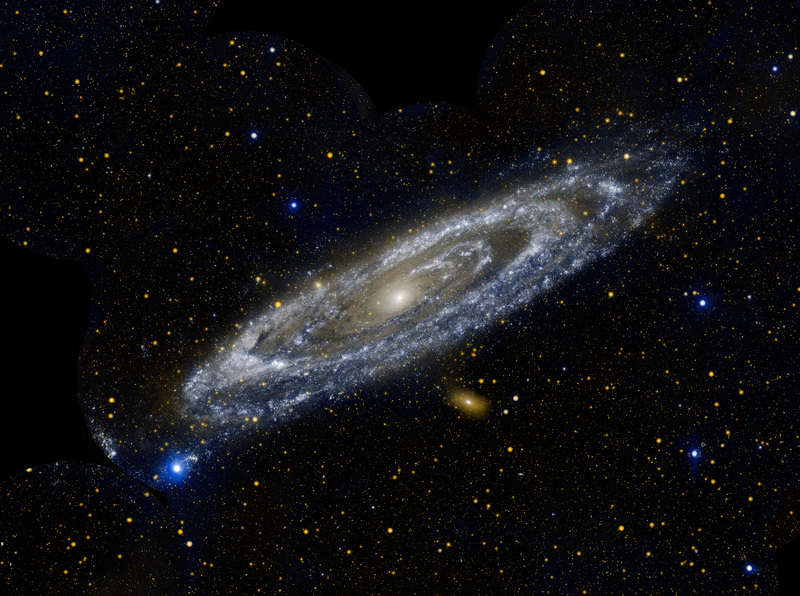 The sky is not only full of stars but also of galaxies and they are very, very far away. 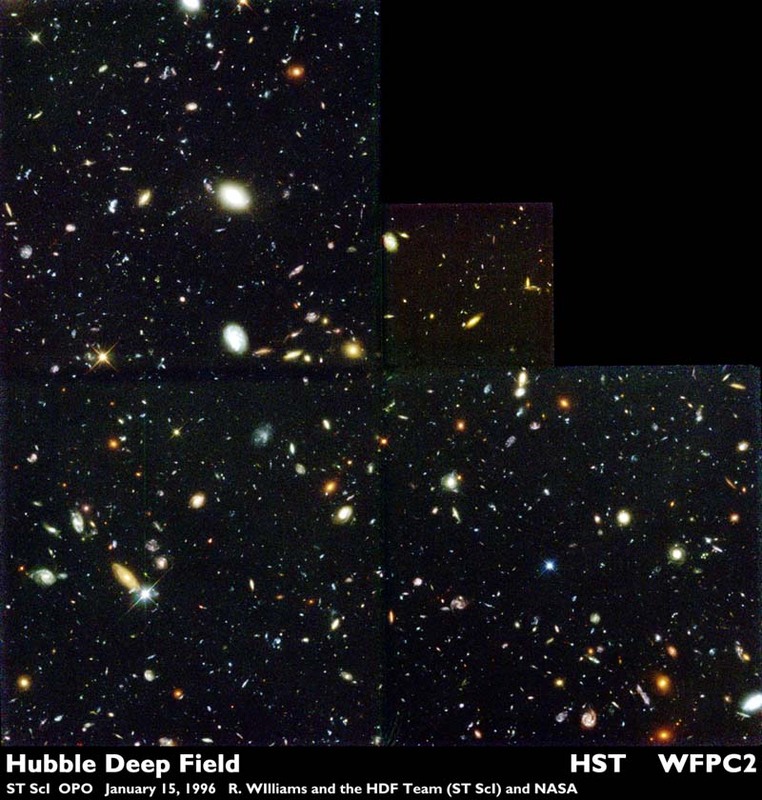 Since that image was taken, the Hubble Space Telescope has produced the Hubble Ultra Deep Field, which revealed ten thousand previously unseen galaxies, even farther away and further back in time, in another “seemingly empty” part of the sky. Sometimes I feel overwhelmed by it all. It’s on those days that I rely most on faith to keep me going. ** Copyright Clumsy Fly Music. Used without permission, but in good faith so hopefully they won’t send their lawyers after me. Twenty years ago today — December 2, 1990 — the Space Shuttle Columbia launched from the Kennedy Space Center carrying seven astronauts and a space observatory. STS-35 astronauts Vance D. Brand, Guy S. Gardner, Jeffrey A. Hoffman, John M. “Mike” Lounge, Robert A. R. Parker, Samuel T. Durrance and Ronald A. Parise surveyed the sky in the ultraviolet and x-ray frequencies using the ASTRO-1 observatory. ASTRO-1 combined the Hopkins Ultraviolet Telescope, Wisconsin Ultraviolet Photo-Polarimeter Experiment, Ultraviolet Imaging Telescope, and Broad Band X-Ray Telescope into a single observatory. Between problems with the data display units used to point and operate the instruments, and bad weather at the primary landing site that cut the mission short, only about 70% of the planned observations took place. And then 5 years later, on this date in 1995, another observatory was launched: the Solar and Heliospheric Observatory (SOHO) flew from Cape Canaveral Air Station atop an Atlas-IIAS launch vehicle. SOHO consisted of twelve different instruments — three from the U.S. and nine from Europe — that have produced stunning images of the Sun and the solar corona, like the one below, over the last 15 years. One hundred twenty years ago today in space history — November 20, 1889 — astronomer Edwin P. Hubble was born in Marshfield, Missouri. NASA, of course, honored Hubble by naming their most famous space telescope after him. And speaking of space telescopes, 5 years ago today, in 2004, NASA launched the Swift Telescope — also known as the Gamma Ray Burst Explorer, or Explorer-84 — on a Delta-II rocket from Cape Canaveral. 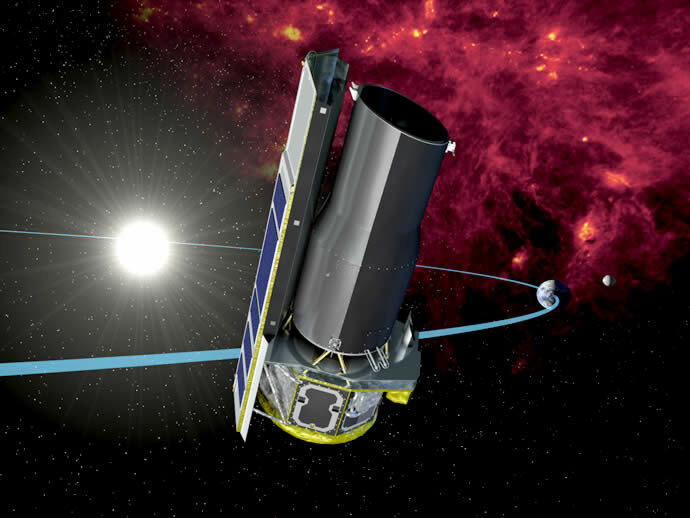 The spacecraft, named after the bird, carried three instruments to detect and locate gamma ray bursts. I think Edwin Hubble would be thrilled to see the new discoveries that have been made, by the telescope that bears his name as well as other, specialized instruments. 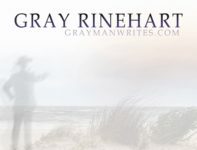 And I wonder what’s next…. The Hubble Space Telescope collected the first visible light images of a planet circling another star. The star, Fomalhaut, is one of the twenty brightest stars in the sky; even though it’s about 27 light years away, it’s visible with the naked eye if you know where to look (an image of the constellation is on the page linked below). The planet, known as Fomalhaut-B, was observed in 2004 and 2006, but not “discovered” until scientists reanalyzed their data this past Memorial Day weekend. The NASA team concluded that the object was a planet based on three factors: first, its relatively low mass of around three Jupiters; second, the presence of a perturbed dust ring in the Fomalhaut equivalent of our Kuiper Belt; and third, comparative images from 2004 and 2006 that show the planet’s motion in its orbit. The team expressed high confidence that Fomalhaut-B was a planet rather than a brown dwarf star because the object did not show up at infrared wavelengths as a brown dwarf should, but was only detected using visible wavelengths. 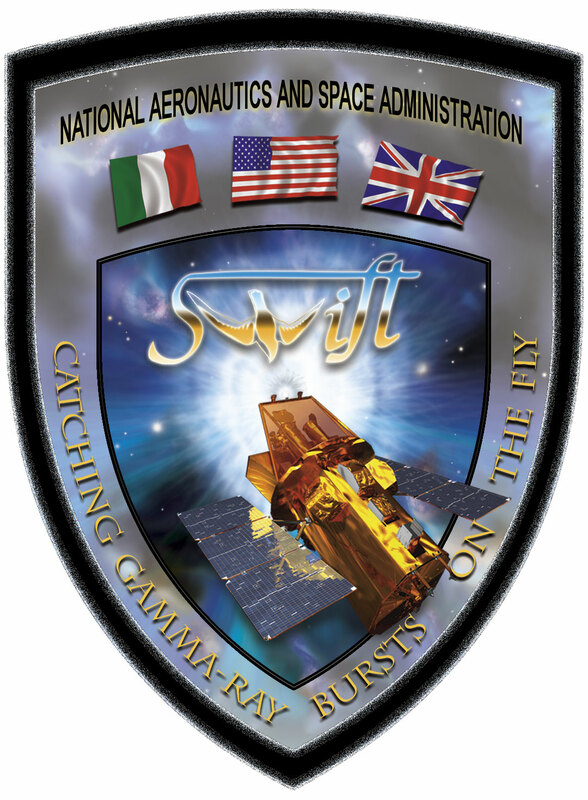 After the next Hubble servicing mission, the team hopes to make further observations of the Fomalhaut system. With a third observation of the planet in its orbit, they can make more accurate calculations of its orbital elements. See this page for the story and this page for the briefing materials. *To add to all the other days when I was space, which seem oh so long ago now. I miss my space days.